It's my 1st Photohunt on this blog and this week's theme is SCARY. Actually it was taken last year on our way to the province when suddenly we stopped bec. of the traffic lights. My niece Reign suddenly screamed " Scary!!" when she looked out of the window and we all got curious what was that. We all looked and it turned out be this big billboard of a movie which I can't remember what is the title. Halloween is so near and just last night there were shows that are already talking about scary stuff like spirits, ghosts and souls. I don't want to get scared so I flipped on the channel. Join us at Photohunters. kagabi ko pa iniisip ano title nito te jen. haha! Creepy! 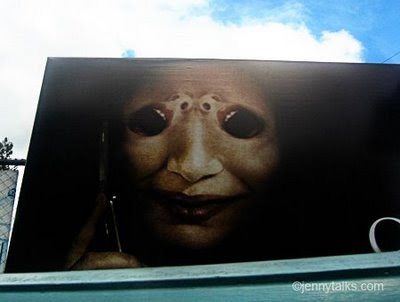 I think I'd scream "scary" if I saw that while driving down the road. Yikes.